A weekly public affairs series designed to inform, intrigue, and encourage the exploration and analysis of important issues in our communities and our state. 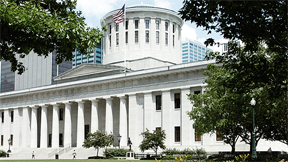 Viewpoint provides thought-provoking disscussions on education, government, sports, politics, religion, and medicine and profiles the movers and shakers in Columbus and beyond as together we struggle with today's issues and tomorrow's challenges. Produced by WOSU in Columbus.